And if Transhuman Space Classic: Broken Dreams is any indication, I recommend enjoying the world while you can, because soon our little globe will teem with the hungry, sick, and dead as the greedy and the insane tear at the edges of our world while technology-gone-rampant destroys it from the inside. Hmm. Perhaps that's a bit bleak. (And, as such, not exactly the best way to entice you into buying our book.) I'll pull it back a bit. 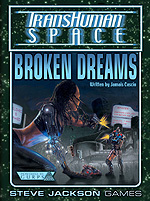 Broken Dreams is all about the less shiny, less nice, less flying-car-y parts of Earth in Transhuman Space. If it can be described as "war-torn," "crime-ridden," or "icky," it's in this book. It's all of humankind's worst bits dragged out into the light, and it ain't pretty. Although . . . Y'know what else it isn't? Boring. So maybe there's hope for this bleak future after all!